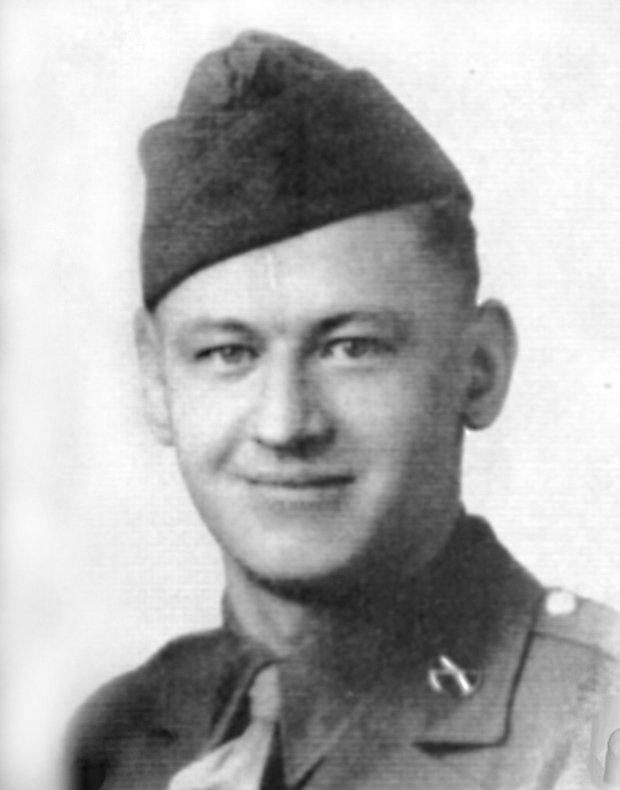 Private First Class Edward J. Moskala was born in Chicago, Illinois and was a member of Co C 383rd Infantry Regiment. He earned his Medal of Honor on Okinawa at Kakazu Ridge on April 9th, 1945. Edward J Moskala was the leading element when grenade explosions and concentrated machine gun and mortar fire halted the unit's attack on Kakazu Ridge, Okinawa, Ryukyu Islands. With utter disregard for his personal safety, he charged forty yards through withering, grazing fire and wiped out two machine gun nests with well-aimed grenades and deadly accurate fire from his automatic rifle. When strong counterattacks and fierce enemy resistance from other positions forced his company to withdraw, he voluntarily remained behind with 8 others to cover the maneuver. Fighting from a critically dangerous position for three hours, he killed more than twenty-five Japanese before following his surviving companions through screening smoke down the face of the ridge to a gorge where it was discovered that one of the group had been left behind, wounded. Unhesitatingly, Pvt. Moskala climbed the bullet-swept slope to assist in the rescue, and, returning to lower ground, volunteered to protect other wounded while the bulk of the troops quickly took up more favorable positions. He had saved another casualty and killed four enemy infiltrators when he was struck and mortally wounded himself while aiding still another disabled soldier. We would like to know more about who this honored soldier. If you are a relative or friend of this Deadeye, please email us with more information to add to this page.